Would you like to know my deep dark secret? My greatest accomplishment in the kitchen was the day I learned how to hard boil an egg. After years of breaking egg whites as I painstakingly shed away at the evil shell, and cursing the heavens every time I got one unpeeled only to discover a green rim around the yolk, I finally figured it out. Nothing beats slicing open a warm egg to find a soft and billowy yellow yolk… to stuff in my face. Sometimes, the easiest things are the hardest to master. Which brings me to my next greatest achievement: making a perfect deviled egg. A good deviled egg can be made with as little as 4 ingredients: eggs, mayonnaise, relish, and paprika. But a perfect deviled egg requires a little more love and creativity. Take Mario Batali’s riff on a classic Hellmann's® recipe called Fiery Chipotle Deviled Eggs. Batali punches up the flavor by adding chipotle hot sauce, spicy mustard, cilantro, and celery salt. And wow, they are good! When I was asked to create my own version of Mario’s recipe to celebrate Hellmann's®100th birthday, I jumped at the chance, and you can too! Just visit Hellmann’s Facebook contest app page to participate in the fun. Not only does Hellmann's® use quality ingredients (like cage-free eggs), but they are helping to provide one million meals to Feeding America to help the fight against hunger nationwide. I am proud to support this endeavor and spread the news! 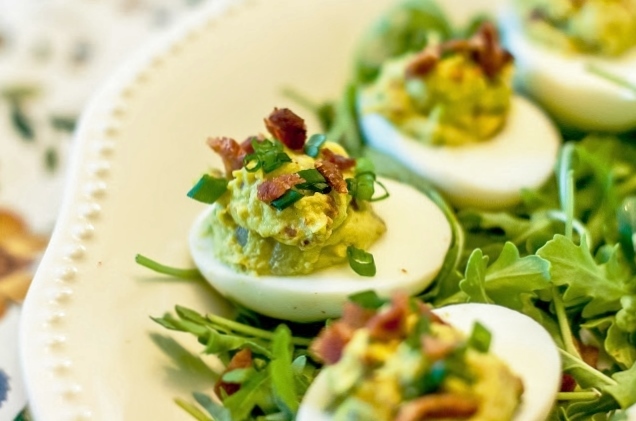 Check out my take on Mario’s recipe I like to call Green Deviled Eggs and Ham. It was inspired by two men who have inspired me throughout my life, Mario Batali and Dr. Seuss. And ya’ll know how much I love avocado and bacon. It could be deemed a problem if we wanted to get technical. But this isn’t a place for technicalities. It’s a place of love. So, let’s embrace my addictions. Tip: Don’t have a deviled egg tray to keep the eggs from rolling around? There is no need to buy a special platter. 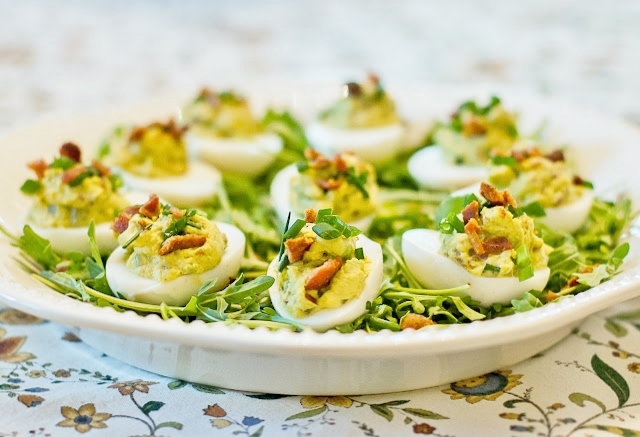 Sprinkle your favorite greens on a serving dish, and nestle the deviled eggs in place. It’s colorful and edible! Place eggs in a single layer in a saucepan; cover in cold water. Brings to a boil, uncovered. As soon as it comes to a FULL boil; cover, remove from heat, and let stand for 10 minutes. Drain immediately and fill the pan with cold water and ice; allow the eggs to become cool to the touch. Tap each egg, big side down, on the counter until it cracks; peel under cold running water. Slice eggs in half lengthwise and carefully remove yolks. Place yolks in a large bowl with Hellmann's®, avocado, relish, sriracha, salt, half the bacon, and half the chives; mash until smooth. Garnish each with bacon bits and chives. And don’t forget to submit your own recipe here! You could win a trip to New York City! Love this idea! Eggs and avocado are a fantastic combo, definitely bookmarking this!